One of the things about this club is that it is entering its 47nd year and can boast a rich history of events and characters that have either passed through our ranks or maintain their membership. I realised at our 40th Anniversary that it is time to start recording as much of our heritage as we can and find ways to display it as a reminder of good times past and a reference for when future decisions need to be made. Here is a taste of the past. It goes back to the origins of the BMW Touring Club of NSW. You can read the names on these awards and realise some are club legends, several are life members, a few are great characters and some are just quiet achievers but all are people who love their motorcycling and the good times it brings. Peter Dennis was a past president of the BMWTCNSW who died while in office. The Peter Dennis Memorial Trophy is awarded by the retiring president to the member considered by him to have made the most outstanding or unique contribution to the club during the past 12 months. The Vice President is often consulted on this matter. The Clubman Trophies are presented to members who compile the highest overall points tally from scheduled events. The run calendar and point score are organised by the Vice President. Points are scored on the following basis. 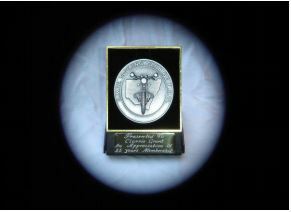 Donated by member Mick Rawstrom in 1994 to carry on this award from previous years. It was originally awarded to the member with highest overall point score from eligible events. Since the introduction of the Country Clubman Trophy in 2002 it is awarded to the most active city based member. This trophy was donated by Motohansa. Commencing in 2002, it is awarded to the country member with the highest points tally from eligible events. This trophy was donated by Motohansa. Commencing in 2001 it is awarded to a new member who is a regular participant in club activities. Similar to the Clubman Awards it is calculated as follows. In calculating the points for the most active new member, all members who joined in the previous calendar year (1st Jan’ to 31 Dec’) are considered. For members joining before July 1st, points are totalled from 1st July to 30 June (the club year or part there of). If the member joined after July 1st then points are annualised (divided by the number of days that they had been a member and multiplied by 365). Commencing in 2006 the editor’s award is presented at the sole discretion of the editor to the member they consider made the most outstanding contribution to the quality and content of the BMWTCNSW Newsletter. The concept of recognising members who have been with us for at least 25 years was introduced in 2005. The inaugural presentations were made at the 40th Anniversary Celebration Dinner. This is the original BMW Touring Club of NSW Clubman of the Year award from the earliest years of the club. As the only award at the time it was fiercely contested. Talk to some of the original members that are still around about the activities of those early years. After the Bill Cooper Shield was full Dave Thompson donated this trophy to continue the Clubman of the Year Award through the years 1978 to 1993.